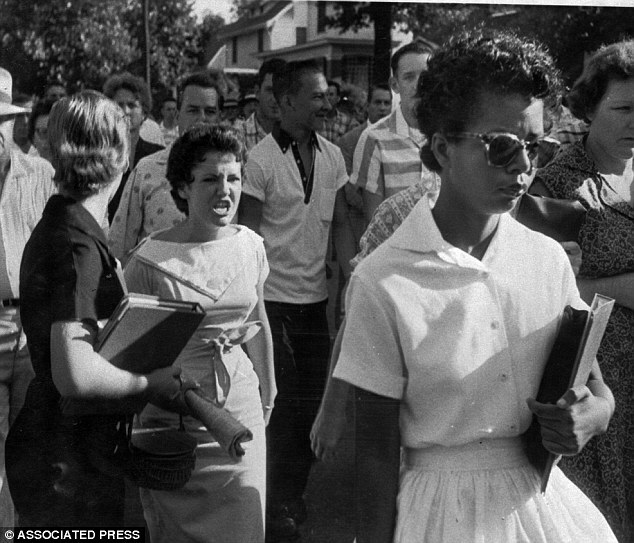 Elizabeth Eckford entering Little Rock Central High School in 1957. In the bad old days of racially segregated schools, the watchword was “separate but equal.” The political fiction was that public schools for black students were the equivalent of public schools for white students. They weren’t. Today’s political fiction is that integrated schools provide the same education for all the students who attend them. They don’t. National reading scores on the NAEP tell the story. NOTE: Sometimes called “the nation’s report card,” the National Assessment of Educational Progress (NAEP) is the largest continuing and nationally representative assessment of what American students know and can do in various subjects. The first NAEP was administeredÂ in 1969. Twenty-first century results of equal education. The chart shows the percentage of fourth-graders who scored at proficiency or above in the years indicated. Main NAEP assessments are conducted in a range of subjects with fourth-, eighth- and twelfth-graders across the country. Reading assessment statistics indicate just how “equal” is the education received by twenty-first-century children in our all-inclusive public schools. Basic = The child is reading below grade level. Proficient = The child is reading at grade level. Advanced = The child is reading above grade level. The most recent scores (2015) are no different for Grade 4 than they were in 2013 when 66% of all U.S. fourth-graders scored “below proficient” and 80% of fourth-graders from low-income backgrounds scored below grade level. That leaves 54% of white fourth-graders, 82% of black fourth-graders, 79% of Hispanic fourth-graders, and 43% of Asian fourth-graders who will find school harder and harder as the years pass. Twenty-five percent of them will drop out as soon as they are old enough. Of the ones who stick it out to graduate from high school, 63% will still be reading at less than a high school level. How can anyone be surprised by the outrageous behavior reported daily in the news media when perhaps as much as 50% of the population is semi-literate? If you are a parent or grandparent of preschoolers, you need to make every effort to send them to school with large vocabularies and knowledge of the sounds and letters of the alphabet. Children who begin school without this information and who do not acquire it by the end of the first grade will never catch up. Explore the pages of the American English Doctor for tips about how to protect your child from school reading failure. Your advice to parents to make reading, creative activities, and math a part of the everyday life of small children is the most important. “Equal” schooling is a misnomer if it only applies to facilities and equipment. I went to a one-room school with one piece of playground equipment, read hard-back books as a young child, and memorized pages of poetry and paragraphs of books. The teacher was still working on her diploma. Books were all over our house and play places and we read Bible stories every night. All that to say that parents might realize that — from a very early age–their part in giving their children “equal” opportunity in the world begins with them–regardless of race or marital status. It is their love of learning that instills a child’s quest or thirst for knowledge even more than what schools offer. Yes, I was a teacher and know how important that role is also. I am also impressed. Keep up the good work. And yes, I did “share” on Facebook. In reference to Mr. Wheeler’s comments: I take umbrage at his term “feral childrenâ€ in reference to those in single-parent households. Many single parents were once married, but due to death or divorce end up taking on the dual role of both mother and father. Toleration, like every other noble abstraction, can be taken too far. An orderly society requires that some behaviors cannot be tolerated if the society is to remain orderly. Maeve hints at it in her advice to parents that they must prepare their children for learning to read. The key word is “receive.” Receiving is an action. It is not merely a matter of preparation, but also of continuous, active participation. Too many families and certain subcultures actively discourage excellence in learning. The roots are varied. Our attitudes toward risky reproductive behavior particularly damage the prospects of many children, as common practices result in single-parent households whose children are socialised not by adults, but by other feral children. Bitterness toward “the system” causes more damage by causing children to reject learning of the skills that lead to productive and profitable lives. You can see this in rejection of standard English. Paranoia and spite turn into self-fulfilling prophecy. The solution, sorry to say, is political, and politics must begin with the people. We must stop crossing the line between tolerating self-destructive behavior and encouraging it, and we must start holding politicians accountable when they exemplify those behaviors and exacerbate divisions. Thanks for the kind words. I realize that there are thousands of language, teaching, and parenting sites out there, but everyone’s experience is different. I feel that my checkered background of academic study, in-the-trenches teaching, and varied employment in the world of business and food service give me a perspective that many educational theorists lack. I am also a slow learner, so I understand what average- and below-average children go through in the classroom. Most impressive site! This type of info is needed, filling a void in the national discussion on education and language.